Platin Coin provide no information on their website about who owns or runs the business. The Platin Coin website domain (“platincoin.com”) was registered on July 4th, 2016. PLC Group AG is listed as the owner, with an address in Zug, Switzerland also provided. Further research reveals this address actually belongs to Regus, suggesting PlatinCoin exists in Switzerland in name only. In PlatinCoin marketing presentations, affiliates name Alex Reinhardt as CEO of the company. Why this information is not provided on the PlatinCoin website is unclear. Reinhardt (right) is based out of Germany and up until recently was promoting SwissCoin. Reinhardt appears to have been head of SwissCoin’s “Team Germany” and was pretty highly ranked within the affiliate-base. SwissCoin is a Ponzi points cryptocurrency scheme launched mid last year. Following regulatory warnings in Germany, Switzerland and Nigeria, the scammers running the company turned on each other earlier this year. Legal action was filed in Switzerland, with Alexa statistics showing the company shortly thereafter entered a decline. This likely prompted Alex Reinhardt to cut ties with SwissCoin and launch his own company. Read on for a full review of the PlatinCoin MLM opportunity. PlatinCoin has no retailable products or services, with affiliates only able to market PlatinCoin affiliate membership itself. PLC Network is an inhouse PlatinCoin social network. PLC Market is an e-commerce platform. As as the time of publication, neither entity appears to have launched yet. PlatinCoin affiliates invest €5 to €10,000 in PlatinCoins, on the promise of an eventual ROI. PlatinCoins are points distributed by PlatinCoin, with an initial set value of €0.10 EUR per point. PlatinCoins are not publicly tradeable and can only be traded and converted into real money via Turbo Button PLC, an in-house exchange operated by PlatinCoin. After May 11th, 2017, the rising value of PlatinCoins will be determined by PlatinCoin. PlatinCoin pay residual commissions on affiliate investment via a unilevel compensation structure. PlatinCoin cap payable unilevel levels at eleven, with commissions paid out as a percentage of funds invested by affiliates in the unilevel team. PlatinCoin reward affiliates who generate large amounts of downline investment with a cash Rank Achievement Bonus. PlatinCoin affiliate membership requires an investment of between €5 and €10,000. The more an affiliate invests the higher their income potential via the PlatinCoin compensation plan. 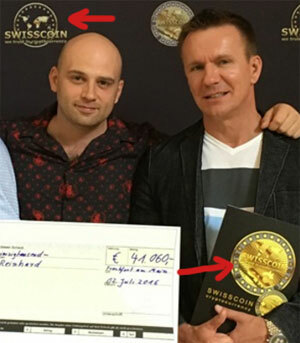 PlatinCoin retains the Ponzi points business model SwissCoin used, but is more closely aligned with OneCoin’s version of the scam. We do not sell coins, we sell the training content and technological solutions. The Ponzi points model sees affiliates invest real money in exchange for worthless points. PlatinCoin is not publicly tradeable and only holds a value within the PlatinCoin MLM opportunity. That value is entirely artificial and is manipulated by PlatinCoin as they see fit. In their official compensation plan documentation, PlatinCoin provide prospective investors with an estimated PlatinCoin value of €10 EUR by the end of 2018. The reality is “sales of business packages” (affiliate investment) is the only verifiable source of PlatinCoin’s revenue. The other sources are just empty promises. And in any event, even using a small percentage of newly invested funds to pay off existing investors is Ponzi fraud. As with SwissCoin and OneCoin, typically in the Ponzi points model however 100% of ROI payouts are newly invested funds. As a top affiliate in SwissCoin, Alex Reinhardt likely made a pretty penny via recruitment commissions (pyramid scheme fraud itself). To what extent Reinhardt was able to convert held SwissCoins into real money is unclear, but it’s likely it paled in comparison to what he made convincing others to invest. As SwissCoin began to stall in late 2016 and early 2017, Reinhardt no doubt realized all he had to show in SwissCoin was an account full of worthless coins he couldn’t cash out. A stall of collapse in affiliate investment sees a Ponzi points scam deny affiliate exchange withdrawals for any number of manufactured reasons (the real reason of course being they have no new funds to pay out with). The real money in a Ponzi point scam is running the company. Top affiliates like Reinhardt make fair coin, but most of the invested funds are squirreled away by the owners in secret offshore bank accounts. Looking to make even more than he did in SwissCoin, Reinhardt is no doubt aware of this and so we have PlatinCoin. Stacked with Reinhardt’s SwissCoin downline and who knows what else, once again the bitcoin comparisons are trotted out. Unfortunately for most PlatinCoin investors however, once again the end result is going to be a worthless altcoin and widespread losses. What is your take on the PLC-Box that launches in july and the whole minting (not mining) process? Cant read anything about that here. My take is it has nothing to do with affiliates investing funds, getting PlatinCoin points and getting a ROI on those points funded by subsequent investment. I did see the PLC Box stuff when researching PlatinCoin but left it out of the review because it didn’t seem to have anything to do with the MLM opportunity. its not that you can introduce a ponzi business with a hardware Box to make all legal. Those 11 level compensation plans to built money are never legal in western societies.. This is only a try to start up collecting Ponzi funds and make everything legal later on. It is also reported that they want to have end of the year a money transmitter license like Paypal or even a small bank license..
Once you are a scammer you always will be..
My prediction is it’ll be delayed, and delayed, and nobody will give a ****. They say this is a an Aritcle paid by business competitors and spreads a lot of untruth. They claim further that Platincoin is a legal MLM-System and not a Ponz scheme. What would you reply to that? I would say specifically, what untruth? The review is based on PlatinCoin’s business model and compensation plan. It’s quite obviously just another Ponzi points cryptocurrency launch. OneCoin affiliates will tell you their review is paid by competitors. SwissCoin affiliates will tell you their review is paid by competitors. Now GladiaCoin are telling you this review is paid for by competitors. Exactly who are these competitors supposedly paying me? They claim further that Platincoin is a legal MLM-System and not a Ponz scheme. What’s that claim based on? Quite obviously not PlatinCoin’s compensation plan, which again is clearly makes it yet another Ponzi points cryptocurrency scheme. What about the praised innovative technology behind the PlatinCoin (hybrid blockchain -> proof of work + proof of stake)? They guarantee a right to return the product in the first two weeks, furthermore the company will buy back the coins from the users once the rate reaches the value of 1 euro. PlatinCoin is the same old Ponzi points business model. The only people “praising it” are greedy SwissCoin investors hoping to rip off a new audience. They guarantee … Wouldnt you say thats untypical for a Poni points cryptocurreny scheme? Anything to get your money. Ask “them” how SwissCoin turned out. That´s a pitty, I really thought it would perhaps be a innovative cryptocurrency. How can people be so stupid and fall into this scam, I guess there are too many stupid people in this world that they can make money off. Another Josh Garza’s business model. They already say its not even a coin during the announcement. This is a rip off of the OneCoin scam. Were from you investigated all this? What are your sources? You say they dont have a real business behind all this. Who did you ask for knowing all this? So when the idea is cheating people, why do they offer packages from 5 Dollar????? What the f*** the will do with 5 Dollar???? That does´nt make sence to me dude! Just offer any proff! Because,” Talk is cheap”! Exhibit A: PlatinCoin’s compensation plan. So when the idea is cheating people, why do they offer packages from 5 Dollar????? To lure people into a false sense of security so they later hand over more money. If you don’t understand PlatinCoin’s compensation plan that’s on you. @ Ronny.. Please use Google Translate as we can not understand you. They send me one PLATINCOIN.. is this really a monkey business? is this scheme decentraLised and open source or centralised and closed source? THAT IS WHERE IT STARTS FOR ME? This review isn’t about SwissCoin. And furthermore, converting Ponzi points into a cryptocurrency doesn’t legitimize Ponzi fraud. i like your investigate blog here. youtube is full with promotion for all this FAKE COINS. this stinks to heaven. No more comments on Platincoin the last 7 months. The info here above is outdated. PLC can be traded outside the platincoin system/websites, so it does kind of looks like a real crypto-currency, and it has indeed one MLM-leg (which one should alwaysbe extremely careful with), but they also are building a ‘real’ or ‘normal’ business leg, where the money not received through subscriptions/membership fees should come. Building a business like this takes time. I surely give them credit. I plan to join, I still consider it like gambling now. In response to a legal request made to Google, we have 4 result (s) removed from this page. For more information about the request, see LumenDatabase.org. Maxim Bederov from Berlin and Orlando Vecellio von Paschiavo from Freienbach.